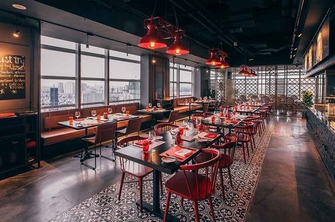 The Cobalt Rooftop Restaurant & Bar, with a stunning panoramic view of Saigon’s skyline, is an urban loft that has an indoor seating and an open-air terrace offering progressive tapas, a grazing menu of selected dishes and designer drinks. The bar and outside decking can accommodate up to 100 guests. Access is via the Cobalt Restaurant on the 30th Floor with LED lights paving the way to the 31st Floor. The city lights provide the perfect backdrop to one of the best views in Ho Chi Minh City. 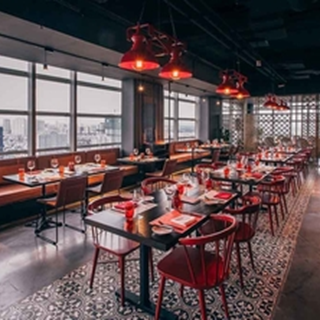 A series of high and low areas on the deck give guests an opportunity to take in what Ho Chi Minh City has to offer whilst listening to the sounds of Cobalt’s resident DJ. I’m wondering why this establishment does not provide service water whereas other Accor Plus establishments provide this? The best aspect of our visit was the friendly staff. The food was pretty good too. Drinks were a bit expensive but it seems to be at par with prices at other similar establishments. Excellent food and a great location. The baked cod was superb. I ordered the month promotion Butcher’s Cut: Surf and Turf. The T-bone and pack of seafood were absolutely good but the langoustine was not fresh. We ordered rump steak and lamb racks. They are very delicious and juicy. The city’s night view is amazing. We celebrated my mom’s birthday at madcow yesterday and it was perfect. The food was great as always and the staffs were very friendly. I was pleasantly surprised because they offered chocolate souffle decorated with my mom’s name on it! And it was absolutely delicious, too. Thank you for the wonderful evening! Best food and drink on trip, service friendly and courteous. Perfectly cooked Steak and Beef Bourgeoisie, excellent service from all staff. The staff are very helpful and friendly. It is expensive for Vietnam dining but very nice. The service was very good, staff were well-presented and polite. Communication was not an issue, unlike other places in Ho Chi Minh. Food was excellent.I had the wagyu, which at less than $50, was very value for money. My partner was raving about her steak, which she adored, as compared to another she had the night before at another venue, with her family, which thoroughly disappointed her. Ms. Anh - waitress take care us very well. Great view from the 30th floor. Staffs have good knowledge about the food and drink served here. 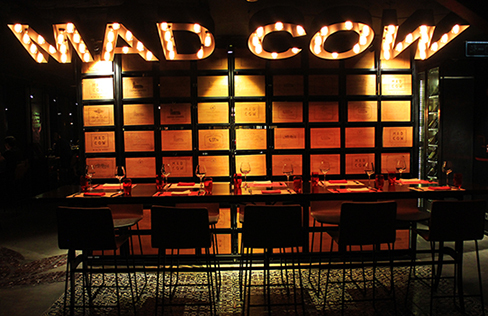 The Mad Cow was one of my favourite restaurants in HCMC but our last visit was disappointing. Our ribeye steak was ordered medium rare and came out very rare, and the service from the abundant staff, though friendly enough, was sloppy eg did not clear away our plates for a long time till asked to. Good value if you have an Accorplus card and dining with a partner. But I invited friends for a table of 7, and it seems unfair to me that the discount is reduced significantly. Hope the restaurant improves on my next visit or I wont be ever coming back. The flat iron is fantastic. I love it.